This is one of the promises of President Rodrigo Duterte in his State of the Nation Address last July. According to Hope Hervilla, assistant secretary of the Department of Social Welfare and Development (DSWD), this is a part of an improved Conditional Cash Transfer (CCT) program of Duterte Administration. The first proposal was 20 kilos of rice per month per family but Senate President Pro-Tempore Franklin Drilon push for the provision of cash subsidies instead of rice supply to the beneficiaries of 4Ps, due to "terrible" system of distributing heavy pack of rice to families. In line with this, DSWD Secretary Judly Taguiwalo agrees to Drilon's proposal. The budget for the 20 kilograms of rice per month, at P32.50 per kilo based on the National Food Authority retail price, would approximately translate to an increase of P650 in the monthly stipend of the 4Ps beneficiaries. The government has allotted P23.4 billion budget for the rice subsidy program next year. The 4Ps program was first introduced in Abra province in 2009 by former President Gloria Macapagal-Arroyo and was continued by former President Benigno Aquino III. Children-beneficiaries aged 3-18 must enroll in school, and maintain an attendance of at least 85% of class days every month. 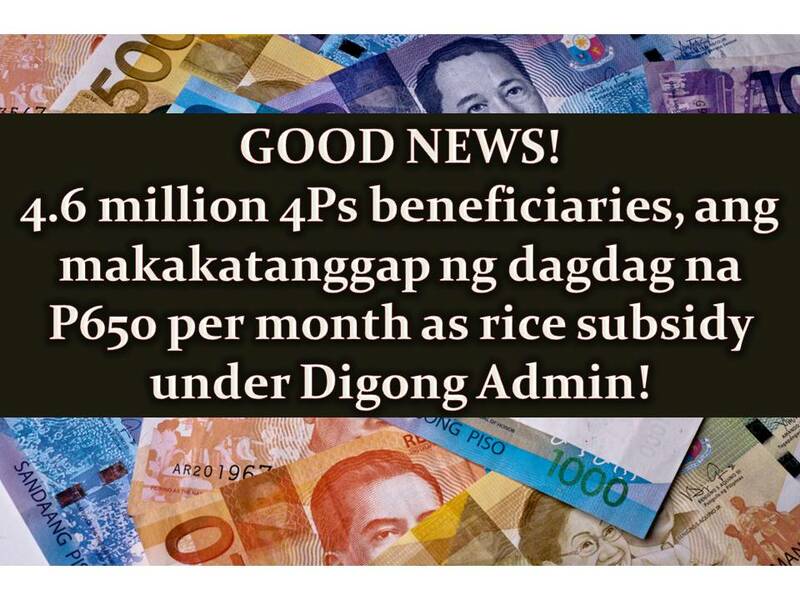 At least 1.3 million families who will be removed from the Pantawid Pamilyang Pilipino Program (4Ps) next year will still be included to its rice subsidy program.